Have you jumped on the Parking Gives Back bandwagon? I have been honored and privileged to work with the Lexington Parking Authority, where three years ago. we rolled out our Food for Fines program that’s received much national and international coverage and PR. Many other parking and transportation organizations have been doing things like this for years, including recent Parking Matters® Marketing and Communication Award winners Ace Parking with their PARK FOR PINK, a fight against breast cancer, and University of Texas at San Antonio’s Peanut Butter Parking Campaign. Read more about these and other Donations for Citations programs in the November issue of The Parking Professional. If you and your team have been thinking about starting a program like these, you might have questions: How did they get that approved? We couldn’t afford to lose that revenue! Let me offer a bit of advice to help you get started. Obviously you must get buy-in and approval from your board, council, campus leaders, etc., so start planning early as this may take time—possibly more than a year. Don’t give up! Pick a well-known charity to work with that has a good reputation in your community or on your campus. Borrow policies and procedures from other entities who’ve paved the way. Don’t worry about the loss of revenue. 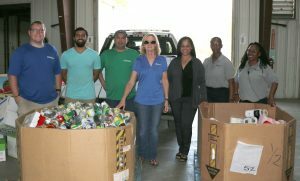 The reality of the numbers of customers who will haul loads of donation items to your parking office will have less bottom-line impact than you think. The value of lost revenues will be far less than the value of the good PR you will receive from your goodwill. At IPI, we want to tabulate the number of ways Parking Gives Back and begin to produce regular stories on the vast ways our great industry organizations have given back to their communities. Think about hours of volunteer time, pounds of food or numbers of food items, blood donations, dollars raised, etc. By the end of 2017 I’m sure those numbers will be huge! Please keep track and tell us about it. Gary Means, CAPP, is executive director of the Lexington Parking Authority. Thank you for being a role model for all of us Gary! Love what you have done with the Food for Fines program for the Lexington Parking Authority!